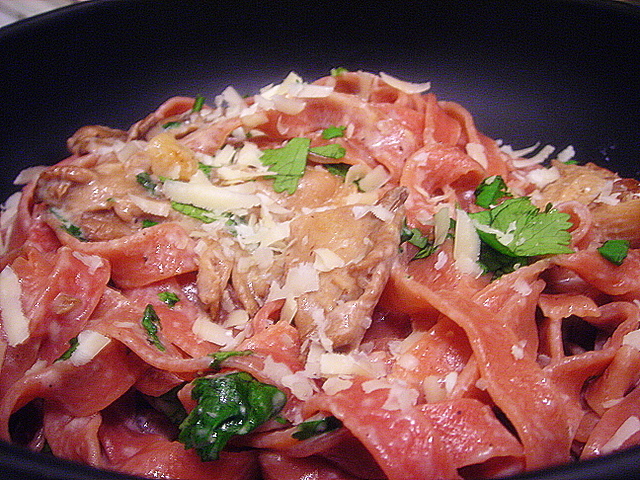 Fresh beet pasta with a mushroom cream sauce (oyster mushrooms, garlic, unsalted butter, salt, pepper, red wine, light cream, Italian parsley, Parm-Reg cheese). Total cooking time: 15 minutes. My mother thinks this is “gourmet”. Wait till she sees me pull out all the stops. 08 Apr	This entry was published on April 8, 2008 at 3:04 pm and is filed under food, general. Bookmark the permalink. Follow any comments here with the RSS feed for this post. How did you make the Beet pasta? Did you add puree or just juice to the dough? Sounds delicious! I always find beet pasta a trifle disappointing because the color is so vibrant when you’re making the dough and when it goes into the water and so much paler when it comes out. I bought some fresh pasta at the greenmarket. I don’t have as much counter space as I’d like in my apartment, otherwise I’d be making pasta every week. IF I were making pasta fresca, I’d add about 1/2 cup beet juice to the dough ingredients (4 eggs, 3 1/2 to 4 cups flour). You can make pasta the usual method (make a well in a mound of flour, break an egg into the well, use a fork to mix together and eventually form/knead the dough) or use a KitchenAid mixer. Regardless of which method you use, add any flavorings before incorporating the ingredients. Takes about a day or so Chubby. You have to give the dough time to rest, then knead it out into thin enough proportions (a pasta machine helps with this), then cut into shapes and if you’re not going to be cooking it that night, you’ll want to dry it for a relative amount of time before freezing it or putting it in the refrigerator. Otherwise it’s pretty good and economical. Food cost for one serving of homemade pasta is probably something like fifty cents. A box of pasta secca is what? $1.50? If it’s whole wheat pasta, expect to pay more. And with the way grain prices are skyrocketing, it’ll be painful down the road.